How Does the OMNIA Vatican Card Work? Who Is the Rome & Vatican Pass Good For? Who Should Avoid the Rome & Vatican Pass? The Roma Pass is a good way to save time and money while sightseeing in Rome, but if you also want to visit Vatican City, you'll need something more. 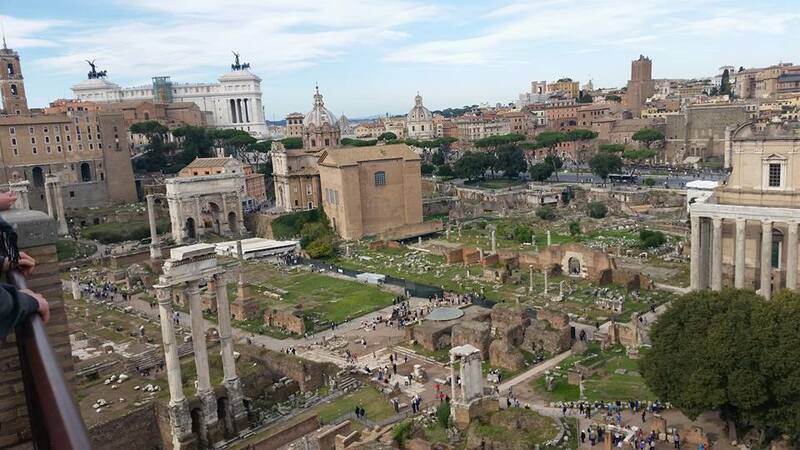 In this Roma Pass review, we'll explore what the pass offers, how much it costs, and how to add the Vatican Card to save even more money in Rome! 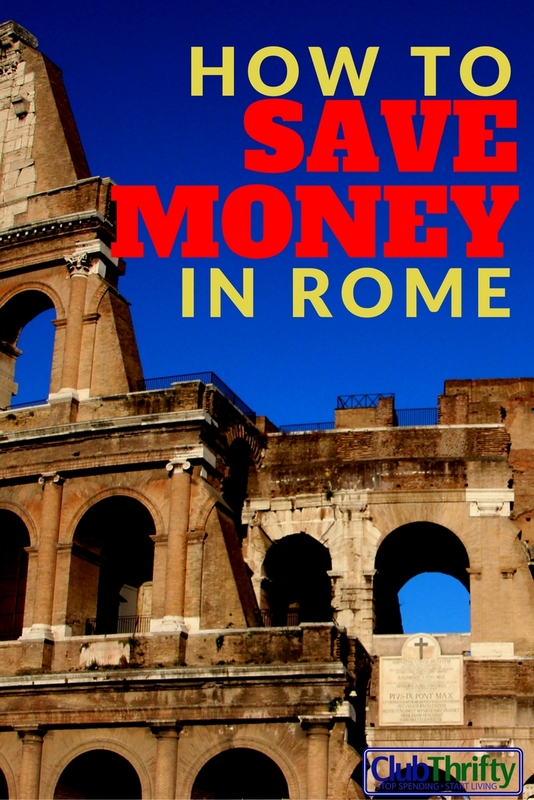 Will the Roma Pass help you save money in Rome? In this Roma Pass review, we’ll explore how the pass works, what it includes, and how to see the sites in Vatican City, as well. Enjoy! Rome is my favorite city in the world. It’s steeped in ancient history, full of awe-inspiring beauty, and brimming with an energy like no place I’ve ever been. Quite simply, visiting Rome is nothing short of incredible. Of course, traveling isn’t cheap… and when you travel as often as we do, you’ve got to find ways to save. But, it’s not just about saving money. While staying on budget is a must, saving time can be just as important. That’s why we always check if the destinations we visit offer a sightseeing pass. These passes typically include discounted admission to the city’s top attractions, plus you almost always get “fast track entry” to a destination’s busiest attractions. Since Rome is one of the most popular tourist destinations in the world, it made sense to check out the Eternal City’s pass offerings before making our first trip there. The first pass we found was the Roma Pass. It looked like a great pass on its own, but there was one major problem. Like any first time traveler to Rome, we really wanted to visit Vatican City! Since the Roma Pass didn’t offer any special discounts to Vatican properties, we continued our search for a pass that did. Enter the OMNIA Vatican and Rome Card. If you’re searching for a sightseeing pass that offers everything you need in Rome, the OMNIA Vatican and Rome Card is it. The OMNIA Vatican and Rome Card is actually 2 passes in one: The Roma Pass and the OMNIA Card. With this combo pass, you have the full Roma Pass at your disposal. Like with all 72-hour Roma Passes, “free” entry is included to 2 of Rome’s best tourist attractions. Additionally, you gain “Fast Track Entry” to the busiest sites, which could literally save you hours of standing in line. What sets the OMNIA Vatican and Rome Card apart is the OMNIA Vatican Card. In addition to everything you get with the Roma Pass, you also receive free admission and Fast Track Entry to the top attractions in Vatican City – including the Sistine Chapel, the Vatican Museums, and St. Peter’s Basilica! So, if you’re looking for the best sightseeing pass in Rome, I’d go with the Rome & Vatican Pass instead. Since the Rome & Vatican Pass combines two separate cards (the Roma Pass and the OMNIA Vatican Card), you’ll use each individual card at specific locations. The Roma Pass portion will get you admission to important sites throughout Rome, many of which include Fast Track Entry. This card also acts as your public transportation pass for bus fares and subway rides. Simply swipe your card on the way in, and you’re good to go. Admission to 2 of the following 7 locations is included with the Roma Pass portion of your travel card. You’ll also receive a discounted admission rate at those you don’t choose, plus discounts on admission at about 30 other sites (current as of February 2019). Entry fees to these attractions alone would cost you between €104.00-€116.00. (The Colosseum and the Forum/Palatine Hill are one entry if you visit the same day, separate tickets if you enter on separate days.) Add the audio guide at St. Peter’s and you’re now at €119.00-€131.00. That doesn’t even include your transportation throughout the city. With the Vatican and Rome Pass, you’ve already saved money on entry to these attractions alone. You’ll also get free access to Rome’s public transportation system and reduced admission to about 30 other sites. While it doesn’t provide as big of savings as some cards (like the London Pass), it is still a pretty good value. Most importantly, the combination of the Roma Pass and the OMNIA Vatican Card gives you Fast Track Entry where you need it most, saving you hours and hours of standing in line. If you want to explore the city on your own, the OMNIA Vatican and Rome Card is the best way to save time and money on sightseeing in Rome. Skip the Lines & Save – Want to save time and money in Rome? Skip the ticket lines AND save money with the Rome & Vatican Pass! Get started here. 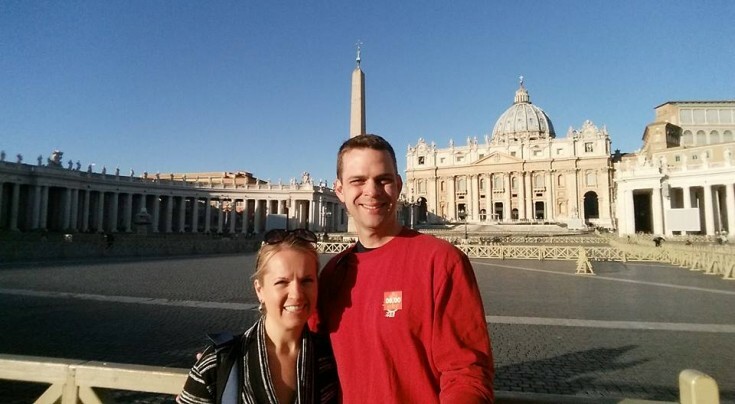 Us outside St. Peter’s Basilica in Vatican City. Although the Rome and Vatican Pass saves you money, that isn’t the biggest draw. Your time in Rome is precious. The last thing you want is to waste it standing in line. In my eyes, having the Roma Pass and the Vatican Card is imperative because you get Fast Track Entry to the busiest sites. Seriously, I can’t stress this enough: Get the card if only for the Fast Track Entry! We’ve visited Rome in November and in June. Even in November, lines to the Colosseum and Vatican Museums were literally hours long. I’m talking at least a 2-hour wait (or more) just to get in, and that is considered off-peak season. Under the hot June sun, the wait times looked to be even longer. Be a savvy traveler and skip those excruciatingly long lines. 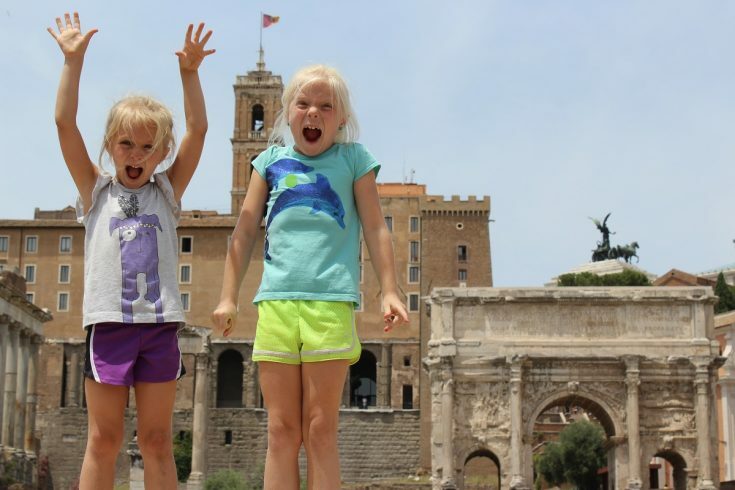 The Roma Pass affords you Fast Track Entry to the Colosseum and the Roman Forum/Palatine Hill. With the OMNIA Vatican and Rome Card, you’ll also gain Fast Track Entry to the Vatican Museums/Sistine Chapel, St. Peter’s Basilica, and St. John in the Lateran and Cloisters church. Trust me on this: It’s well worth the money for fast track entry alone. Free Travelcard – Similar to the Paris Pass, the Roma Pass also provides free unlimited access to Rome’s public transportation system. Hop on a bus or train to quickly get where you want to go. Just swipe your card, and you’re on. Remember, if you use your card first on transportation, the clock starts ticking on your 3 consecutive days limit. Hop-On-Hop-Off Bus Tour – Make your way around Rome and Vatican City using the Hop-On-Hop-Off Bus Tour. You get free access to the tour for 3 days. Pick up a bus on the way to your next destination, or ride the loop to see all 12 sites at once. The tour also includes a free audio guide. Just look for the white and yellow buses at 12 different locations! Free Guidebook and Map – When you purchase the OMNIA Vatican and Rome Card, you’ll also receive a complimentary guidebook and map. Use the guidebook to help plan your Roman holiday. Check the map for getting around Rome and Vatican City, plus use it to find the hop-on-hop-off bus stops. Free Audio Guide – Use your OMNIA Card to get a free audio guide at St. Peter’s Basilica. Audio guides are a great way to add more depth to what you’re seeing. Discounted Admission – Yes, the OMNIA Vatican and Rome Card offers free entry to many of the top destinations in Rome and Vatican City. However, once you use all of those, you still get discounted pricing at about 30 different sites. Just be sure to use your card within the 3-day activation period! Visit the Top Sites in Rome & Vatican City – See the best sites in Rome and Vatican City for less with the OMNIA Vatican & Rome Pass. Learn more here. Overall, the Rome and Vatican Pass is a pretty good deal – especially when you consider that it includes fast track entry to the top spots AND access to public transportation. However, there are a few flaws. First, it saves money…but not a ton. 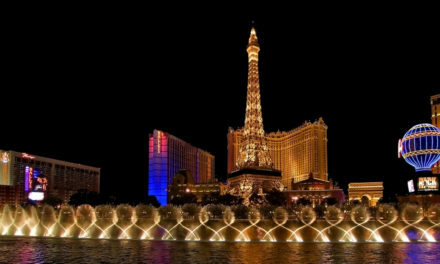 While some of our favorite cards (like the New York Pass) can potentially save travelers hundreds of dollars in entry fees, the savings with this card are far more modest. However, you do get fast track entry at the busiest spots, and that feature is practically worth it alone. The fact that you have to schedule your entry times to the Vatican Museums/Sistine Chapel and St. Peter’s is also a giant pain. Don’t plan on visiting the Vatican sites on your first day in town…and don’t wait to book your spot either. Instead, head up to Vatican City to make your appointments. That way, you’ll have more slots to choose from. Finally, Rome is full of exceptional history and stories, and I think some of those are best told through an actual tour guide. While some sightseeing passes include guided tours, this one does not. On the flip side, personally, I don’t particularly like guided tours of art museums. I’ve been on two guided tours of the Vatican Musuems/Sistine Chapel and have used the OMNIA Vatican Card to visit once. I much prefer the experience with the Vatican Card because I a) got to see far more of the museum and b) was able to take it at my own pace. So, in this case, I much prefer not having a guide and would definitely recommend the Vatican Card instead. Visitors who want to visit Rome & Vatican sites – Travelers who want to visit sites in both Rome and Vatican City should definitely consider getting this pass. By combining the Roma Pass and the OMNIA Vatican Card, you’ll have access to the best sites both have to offer. First-time visitors – If you’ve never been to Rome before, the Roma Pass and Vatican Card offer discounted entry to most of the sites you’ll want to visit anyway. Public transportation (subways & buses) are also included in the pass, so you’ll save money and steps there too. Those who enjoy exploring at their own pace – The Rome and Vatican Pass is good for 3 consecutive days once you activate it. Take that time to explore the sites at your own pace. Visitors with no interest in Vatican sites – If you don’t plan to visit the Vatican sites, you’ll be able to save more by skipping the combo card and getting the Roma Pass on its own. Travelers who prefer tour guides – Although most sites offer audio guides, if you’re somebody who would rather pay extra for a live tour guide, skip the pass and book tours instead. You can find the best Rome tours here. Schedule Your Vatican Visits – Unlike the attractions in Rome, entry into Vatican City locations is timed. Once you arrive in Rome, visit the office in St. Peter’s Square to schedule a time to enter the Vatican Museums/Sistine Chapel and St. Peter’s Basilica or you’ll be out of luck. Time slots are available on a first come, first serve basis. Keep this in mind before planning your time in Vatican City. (Entry to St. John in the Lateran does not require scheduling.) You might consider picking up your pass at St. Peter’s Square on the first day you’re in town and scheduling your Vatican time slots then. Roma Pass is Good for Consecutive Days – The Roma Pass is a 3-day consecutive pass. That means it expires 3 days after you use it. Don’t activate it late in the day, even on public transportation. That will count as a full day, which could mess up your plans. Start Early – To pack the most value into your card, be sure to begin sightseeing early every day. The more sites you can see, the more value you’ll get from the card. Visit Colosseum & Forum on Same Day – Admission to The Colosseum and the Roman Forum/Palatine Hill is counted as one entry if you visit them both on the same day. I highly recommend you do so. (FYI, the Forum is my favorite place to visit in all of Europe.) Make sure to give yourself plenty of time at these locations because you’re only allowed one entry per site with the pass. Ordering your OMNIA Vatican and Rome Card is easy. 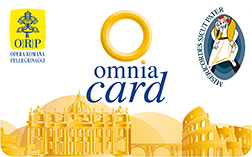 Simply head over to the OMNIA Vatican and Rome Card website by clicking here. Click “Buy Now” and you’re all set. 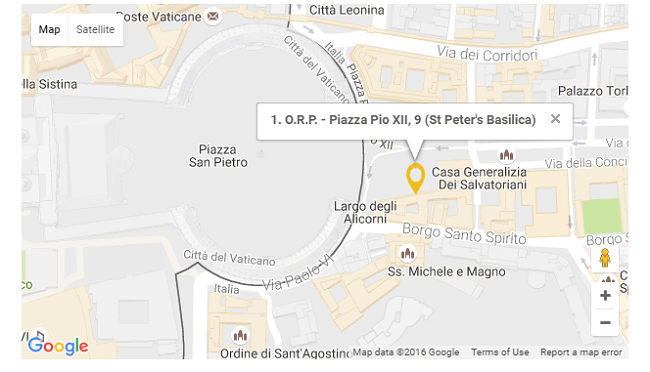 To get there, you literally walk into the area known as St. Peter’s Square (Piazza San Pietro). If you’re coming from the east, walk into the square and look at the building immediately located to your left. (If you walk into the circle, you’ve gone too far.) Coming from the south, follow the outside of the circle until you’ve come to the center on the east side. Look to your right, and you’ll see the office. Head in and pick up your passes at the desk. Then make your appointment to see the Vatican Museums, Sistine Chapel, and St. Peter’s Basilica. If you’re looking for some other ways to help you save in Rome, consider applying for a great travel credit card. These cards will help you build points you can use to save on flights and hotel rooms. And when you save on the big costs, you have more money to spend while in Rome. 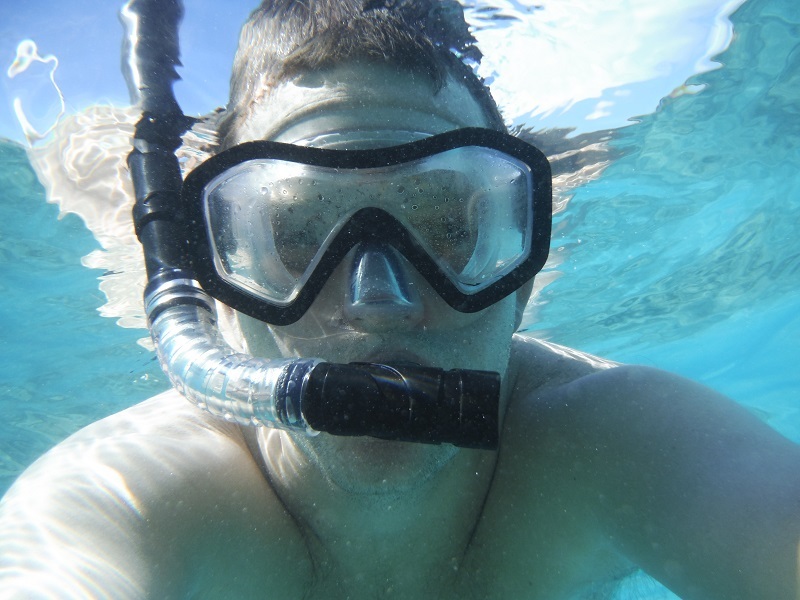 My favorite travel card of all is the Chase Sapphire Preferred Card. This card is currently offering a 60,000 point bonus when you spend $4,000 in the first 3 months. Redeem your $750 in travel through the Chase portal. The points also transfer to 13 different loyalty programs at a 1:1 ratio. Some programs include United Airlines, British Airways, Hyatt, Marriott, IHG, and more. The card does have an annual fee of $95, but the bonus points far more than cover it the first year. This is the first card we recommend to almost every traveler. Since the points are super flexible and very valuable, it’s a great first rewards card for anybody’s wallet. If you only want to see the sites in Rome, the Roma Pass is great. But, if you want to visit Vatican City while you’re there, I’d definitely go with the OMNIA Vatican and Rome Card instead. The OMNIA Vatican and Rome Card gives you access to everything on the Roma Pass plus some. In fact, the Roma Pass is part of the package. You also get the OMNIA Card, which allows you to enter the Vatican attractions as well. Better yet, you get Fast Pass Entry to all the most popular places. So, why get just the Roma Pass when you can have it all with the Vatican and Rome Card? We hope you’ve enjoyed our Roma Pass review! Have a wonderful trip to Rome, and please let us know if you have any questions. Happy traveling! Get Your OMNIA Vatican & Rome Card! – Visit the best sites in Rome and Vatican City! Get the Vatican & Rome Card to skip the ticket lines and save money. Follow the link above to get yours now! NextHong Kong Pass Review 2019: Is it a Good Buy? I wish I had known about this pass before I went to Rome! My friends and I were definitely winging it, and probably spend a lot more on these attractions than we needed to. I’ll keep it in mind for my next trip! Oh man! I wish you would’ve too Kate. But, IMO, one visit to Rome isn’t enough 🙂 Now you know for next time! Wow Greg, I didn’t know such cards existed (maybe it didn’t 12 years ago?) but having all those benefits all in one is fantastic. You listed out the prices and it’s definitely worth it, particularly when time = money! Thanks so much for this recommendation. When we go to Rome we’ll definitely get this! I think a lot of people travel to these places without ever searching for a way to save time and money. Most of the large cities have a travel card of some type. Some offer better benefits and discounts than others. This particular card saves a little money, but the biggest draw is the Fast Track Entry. The lines at the Colosseum were probably 2.5 hours or more when we were there. I’m guessing at least that for the line outside the Vatican Museum and St. Peter’s Basilica. The last thing I want to do on my trip is waste my time standing in line! With our Europe trip pushed back to 2017 from 2016, Italy is yet again at the top of our list of places we are considering visiting. I’ve been learning French in my spare time so there’s a good chance we will go that route, but Italy is still in the running! I don’t think you can go wrong either way, although I have a soft spot in my heart for Italy. Incredible beauty, incredible history, and extremely welcoming people…plus the food is delicious. I live one hour far from Rome and every time I visit It I discover something new, it is called the Eternal city and it is absolutely true!!! It really is an amazing place. I’d love to live there for a few months and just explore. It’s incredible. Would you believe I’ve been to Italy four times, but I still haven’t made it to Rome? Next time I visit, Rome is absolutely a must! Actually, I can believe that 🙂 Italy is so freaking amazing that I can see how you didn’t make it that far yet. But yes, you definitely need to get to Rome. It is incredible. Rome is so amazing, and so large with so much to explore. I’ve never heard of this pass before! I’m currently monitoring flights to see when I can get a deal. Shouldn’t be so bad since I’m in Thailand right now instead of the states! Jealous! We hope to get to Rome again next year sometime. We found the Roma pass first, but realized it didn’t have all we needed. So, we doubled it up with the OMNIA pass, and we were set. It’s really a great tool, especially to skip the lines! My husband and I are visiting in January 2017 for 7 days. Do you think the pass would be needed at the time given the smaller crowds at that time? I haven’t been in January, but I was there off-peak in November. By my estimation, I’d get the pass. From those I’ve talked to, lines at the Colosseum are always long. If you want to see the Vatican sites, those lines are also incredibly long…like several hours. I’d get the 3 day pass, see what you can with the pass on those 3 days (Colosseum, Forum, St. Peter’s, Sistine Chapel/Vatican Museum) then use the other days to see things where there aren’t lines and are often free (Parthenon, Trevi Fountain, Spanish Steps, Piazza Navona, etc.). Have a great time! You’ll love it! Thanks for reading! The Roma Pass portion of the card provides admission to the Colosseum and Roman Forum (Omnia Card portion is for the Vatican sites). If you visit both the Colosseum and the Forum the same day, it counts as one admission ticket. Hope that helps! Can you purcchase the Roma Pass at the Termini Station upon arrival and then activate it there. Rather than getting it online before travelling? Or is it easier to purchase the Roma Pass online beofre leaving the USA? It’s my understanding that you can purchase the Roma Pass at Termini, but I always suggest buying online before you go. When it comes to sightseeing passes, I almost always buy mine ahead of time online. I think it is more convenient – and depending on the pass – you may save a little money. if you buy the pass online, do you still have to reserve your time for vatican city in person? Very true Kelly. Whenever you’re visiting churches, it’s always good practice to check the dress code. Many (including the Vatican sites) require covered shoulders and knees. Question: Our stay in Rome happens to land on weekend in June, arriving 2pm Friday and departing 8am Monday. Is either of the passes worth the purchase, with it being the weekend? I know, what horrible luck. Thanks! Man, that’s a bummer that you only have a the weekend in Rome. Since you won’t be getting there until 2 PM on Friday, you’re going to be packed really tight. If you do get the pass, I’d probably start off heading directly to the Colosseum/Forum. Summer hours last until roughly an hour before sunset. So, you’ll probably have time to spend a couple of hours at both. Also, be sure you set up your scheduled times at the Vatican ASAP. I believe the Vatican Museums are closed on Sundays (except the last Sunday of the month), so your only real shot will be to get in on Saturday. I hope that helps! Have a wonderful time, and let me know if you have more questions. Thanks for your review. You answered exactly the right questions I had during my Rome trip preparations. Thanks for this info….great reading! It appears that the Omni Vatican and Rome Pass is valid for 3 days once activated. Because the Omni Vatican and Rome Pass are essentially 2 different and separate cards, can I activate each one separately, which would essentially extend their use to a total of 6 days? Basically … use the Rome Pass card on day 1 and then activate the Omni Vatican card on the 4th day? Or once I activate one of these cards, both are activated? How far ahead can I buy passes online. It looks lije they have to be picked up the same day when you get to the check out page. Karen, you can definitely purchase the pass ahead of time. You can either have it shipped to you or pick it up for free in Rome. To pick it up in Rome, you’ll need to print off your email confirmation and bring it and an ID to one of the collection points in Rome. I prefer using the collection point at the Vatican, but it’s up to you. Thanks! We are leaving in two weeks and appreciate all of your tips. Absolutely! Have a wonderful time. We absolutely love Italy!!! Is the Vatican sights open on Sunday 7 January 2019? my family and I are going in February half term this year. When we have looked at individual tickets, they are saying that it is all booked up. Thanks Greg – I (Luckily) stumbled on your great post. I was not aware I had to reserve to get into Vatican City. I still have months to go before we’re in Rome (we’re going in August) but there’s lot’s to figure out – your post sure has helped – so THANKS! Thank you for all the information regarding passes. I’m so sorry but I have to ask, would you mind confirming whether both Rome Pass and Omni pass is valid for 3 days once activated? or is this separate 3 days per card? Reason being with the Rome Pass, admission to 2 out of 7 locations. You mention that both Colosseum & Roman Forum is equivalent to 1 site which is good as this is our Day 1 in Rome. Day 2 we are planning to do visit Capitoline Museum & National Museum is this also equivalent to 1 site or is this separate? Day 3 would be Vatican Museum which this will be on Omni Pass. Thanks for reading. The entire package is good for 72 hours once you activate it. The Colosseum and Roman Forum are actually one ticket (when purchased on-site), so visiting them on the same day only counts as one of your two attractions on the pass. The Capitoline Museum & National Museum are two separate tickets, so they each count as a site on the pass. As a reminder, if you end up using the card, be sure that you make your reservations for your Vatican Museum entry ASAP after getting to Rome! We are going to Rome at the end of May and I will be purchasing our Roma and Omni passes today. Should i reserve our entry to the Vatican today or wait till we arrive in Rome and go to the square and do it there? Is it even possible to reserve it now? Also, We arrive in Rome Sunday May 26th in the afternoon and will be departing Rome Wednesday May 29th at noon. Since the pass is for 3 days and includes buses and trains, should i use it to get from the airport to lodging or from lodging back to the Termini? Which do you feel is a better use? As far as transportation goes, it totally depends on where you are staying, airport/train station you’re using, how many people you have with, etc. Personally, we like to book a private transport from the airport to our hotel, usually for like $50 or so. It works great. Am I able to use the pass to get from the airport to lodging! It depends on where you are flying into. The card does NOT cover transportation to/from Fiumicino Airport, which is where you are likely flying into. You can get to/from the city center to Ciampino Airport using a combination of Metro trains and buses. Hi Greg – thanks for the info. Quick question – my kids do like the audio guides – do you know if it is possible to use these passes to get the fast track into the site but then still purchase an audio tour once inside?